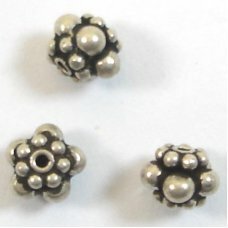 Sterling Silver beads are made from 92.5% pure silver alloyed with other base metals, (often copper). This section includes a mixture of machine made and cast beads from Indonesia known as Bali silver beads. Many are 'antiqued' with Liver of Sulphur which, once dried, darkens the crevices of the beads and therefore highlights the raised parts after they have been polished - if you'd prefer your beads to be shiny silver, you could put them in silver dip before you make them into your jewellery and after they are dry, polish to a shine. Although all are .925 sterling silver (STS) most are not marked. We have an extensive range of findings here. 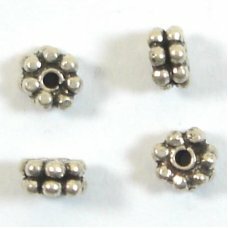 10 2mm Sterling Silver Beads, hole 0.65mm. 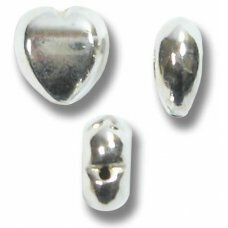 Discount available for quantities of 10 packs and o..
1 Sterling Silver 10mm BeadSterling Silver is 92.5% silver, the balance being a mixture of other met..
1 Sterling Silver Heart Bead, approx 8x8x4mm drilled top to bottomSterling Silver is 92.5% silver, t..
1 Sterling Silver 6x1.5mm Bright Daisy Spacer BeadImage shows spacers in sizes 3, 4, 5 and 6mmS..
1 Brushed Sterling Silver 10mm Wavy Disc Spacer Sterling Silver is 92.5% silver, the balance being ..
1 Sterling Silver Double Daisy Bali Spacer Bead, measures approx 5mm diameter x 3mmSterling Silver i..
1 Sterling Silver Granulated Bali Spacer Bead, measures approx 6mm diameter x 5mm.Sterling Silver is..
1 Sterling Silver Spacer Bead with Blue Chalcedony Cabochon, measures approx 16x16x7mm. Sterling Si..
1 Sterling Silver Spacer Bead with Garnet Cabochon, measures approx 16x16x7mm. Sterling Silver..
1 Sterling Silver Spacer Bead with Tigers Eye Cabochon, measures approx 16x16x7mm. Sterling Si..
1 Sterling Silver Spacer Bead with Black Onyx Cabochon, measures approx 16x16x7mm. Sterling Si..
1 Sterling Silver Spacer Bead with Lapis Cabochon, measures approx 16x16x7mm. Sterling Silver is 92..
1 Sterling Silver Bali Spacer Bead, measuring approx 9mm diameter x 1.5mm Sterling Silver is 92.5% ..
1 Sterling Silver 8mm rubber lined stopper bead. With 3.5 mm hole, used to secure onto cord or chain..
1 brushed Sterling Silver bead with pierced decoration, measures approx 19mm diameter x 6mm across. 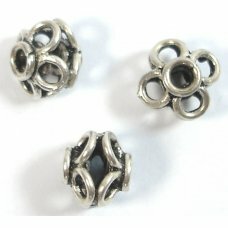 ..
1 Sterling Silver wheel bead, measuring approx 6mm diameter x 3.5mm long. Sterling Silver is 9..
1 Brushed Sterling Silver 10x4mm Lentil Bead, drilled across the diameter top to bottom. Sterling S..
1 Sterling Silver Tube and Corners Bead – this is an interesting bead with a tube for the cent..
1 Sterling Silver Sparkly Two Loop Link – a fab component for making a stunning necklace. A g..
1 Sterling Silver Fancy Heart with two stringing holes; lots of possibilities with these lovely..
1 Sterling Silver Cubism Bead measures approx. 8mm.Sterling Silver is 92.5% silver, the balance bein..
1 Sterling Silver Square Spacer Bead measures approx 5x5x3.5mm.Sterling Silver is 92.5% silver, the ..
1 Sterling Silver Fortune Bead approx. 10mm hole is length of bead (like the word). Sterling Silver ..
1 Sterling Silver Loop Link measures approx. 16 x 12 x 4 mm. 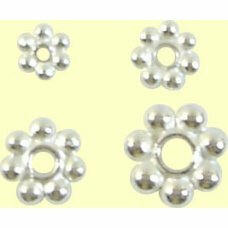 Sterling Silver is 92.5% silver, the ba..
10 bright Sterling Silver 4x1.1mm daisy spacer Beads.Image shows spacers in sizes 3, 4, 5 and 6..
1 Sterling Silver Spacer Bead measures approx. 7 x 3 mm. Sterling Silver is 92.5% silver, the balan..
1 Sterling Silver Punched Hole Squares/Diamond Shape great for earrings links etc dangle things thro..
1 Sterling Silver Pansy Leaf Design Beadcap lovely beadcap with lots of detail measures approx. 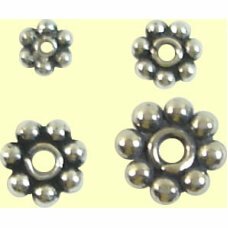 11.5..
1 Sterling Silver 6x1.5mm Oxidised Daisy Spacer BeadImage shows spacers in sizes 3, 4, 5 and 6mmSter..
1 Brushed Sterling Silver Quatrefoil Disc – measures approx. 9x9mm. Sterling Silver is 92.5% si..
Sterling Silver Alphabet Beads MUM Plus a Heart this is a cute little set of Sterling Silver cube be..
10 Sterling Silver 5x1.5mm Daisy Spacer Beads Image shows spacers in sizes 3, 4, 5 and 6mmSter..
1 Brushed Sterling Silver 8mm Wavy Disc Spacer Sterling Silver is 92.5% silver, the balance being a..
1 Sterling Silver Large Hole Box Shape Bead these would be great for Pandora style bracelets. Measur..
1 Triangle Sterling Silver Spacer with a ring in the middle (approx. 4mm) with three clusters of Ste..
10 oxidised Sterling Silver 3.3x1.1mm daisy spacer BeadsImage shows spacers in sizes 3, 4, 5 an..
1 Sterling Silver Square Spacer Heavy Bead measures approx 6.5x6.5x4.5mm.Sterling Silver is 92.5% si..
1 Shiny Sterling Silver 6x4mm Cushion Bead Sterling Silver is 92.5% silver, the balance being a mix..
1 Sterling Silver Spacer Bead measures approx 18x15x3mm.Sterling Silver is 92.5% silver, the balance..
10 bright Sterling Silver 5x1mm daisy spacer BeadsImage shows spacers in sizes 3, 4, 5 and 6mmS..
1 Sterling Silver and Citrine Little Flower Bead hole at the top of the bead through one of the peta..
10 Bali Sterling Silver 5x1mm spacer beads with rope design. 2mm holeDiscount for purchases of 10 pa..
2 Sterling Silver Beadcaps these also make good tube ends the beadcaps measure approx. 9 x 6 mm Ster..
10 Oxidised Sterling Silver 4x1.1mm daisy spacer Beads Image shows spacers in sizes 3, 4, 5 an..
1 Sterling Silver Bohemian Glass Flower Link Bead lovely dark blue with violet/pink highlights this ..
Sterling Silver Alphabet Beads LOVE Plus a Heart this is a cute little set of Sterling Silver cube b..
10 Sterling Silver 5x4mm Bead CapsDiscount for purchase of 10 packs or moreSterling Silver is 92.5% ..
1 Brushed Sterling Silver 6mm Wavy Disc Sterling Silver is 92.5% silver, the balance being a mixtur..
1 Sterling Silver Side to Side Heart Bead Love with the word Love on both sides just slide a chain t..
10 Sterling Silver StarLike Spacer Beads approx. 8x1mm hole 2mmDiscount for purchase of 10 packs or ..